Goodreads says, "Seraphine Mayes and her twin brother Danny were born in the middle of summer at their family’s estate on the Norfolk coast. Within hours of their birth, their mother threw herself from the cliffs, the au pair fled, and the village thrilled with whispers of dark cloaks, changelings, and the aloof couple who drew a young nanny into their inner circle. Now an adult, Seraphine mourns the recent death of her father. While going through his belongings, she uncovers a family photograph that raises dangerous questions. It was taken on the day the twins were born, and in the photo, their mother, surrounded by her husband and her young son, is beautifully dressed, smiling serenely, and holding just one baby. Who is the child and what really happened that day? One person knows the truth, if only Seraphine can find her." Seraphine was born and raised at a large estate in England called Summerbourne along with her twin brother and older brother. Her childhood would have been idyllic except for the fact that her mother committed sucide the day she and her brother were born by jumping off the cliffs near their house. After her father's untimely death many years later, she finds herself going through his personal belongings at Summerbourne. While doing so, he finds a suspicious picture of her mother looking happy on the day of the twin's birth and holding only one baby. Could this person have jumped off the cliffs minutes later after such a normal looking photo or is there more to her mother's story than Seraphine knows. Her grandmother doesn't give her straight answers, so she knows that she must contact her older brother's former au pair. This au pair should definitely have the answers as she was around when her mother was pregnant and on the day she died. While doing so, Seraphine uncovers some major secrets about her family. 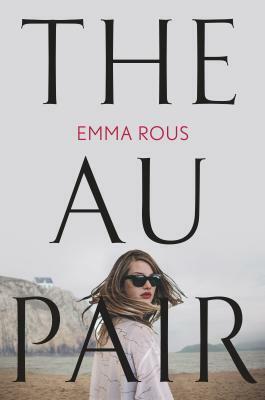 The Au Pair by Emma Rous is a domestic thriller about family secrets and cover ups all with a Gothic vibe. Seraphine wants answers despite her grandmother's warning that she really shouldn't pry. Her grandmother's insistence on not reaching out to the former au pair made Seraphine even more curious. Can you blame her? What could her grandmother be hiding? As Seraphine gets more and more answers about her family's sordid past, she starts to learn the truth about her own life as well as some answers regarding her childhood. I can understand why Seraphine would want to know what happened to her mother, so I was rooting her on in The Au Pair. I liked that the narration often jumped back to the past in The Au Pair, so readers could try to put the pieces of the mystery together on their own. Who exactly is Laura, the au pair, and what does she know? Why did Seraphine's mother act the way she did? What drove her to allegedly jump off the cliffs? As we spend more time in the past and read some chapters from Laura's viewpoint everything starts to become clearer. The English manor house setting on the coast was fantastic and it reminded me of British novels I have read in the past that take place on sprawling estates all complete with fancy names. Summerbourne was also surrounded by legends (there was talk of fairies, too!) and the townspeople often discussed it and the many unfortunate things that occurred there as the years went by. It was such an interesting setting and it definitely added to the Gothic feel in The Au Pair. My only gripe with The Au Pair was the lack of connection I felt with the characters. While I cared about Seraphine, I wasn't overly invested in her or her plight. Sure, I wanted to know her family's secrets, but I can't say I connected with her tremendously. Perhaps the characterization could have been more fleshed out. Nonetheless, if you love family mysteries with a Gothic vibe, give The Au Pair a try this winter. I love Gothic stories, I love stories about families, I love sprawling estate settings! I'm on the library wait list for this one! Too bad the characterization wasn't great! This sounds really good, I'm adding it to my TBR.